Caribbean Poker | Get up to £1,100 & 130 FREE Spins! 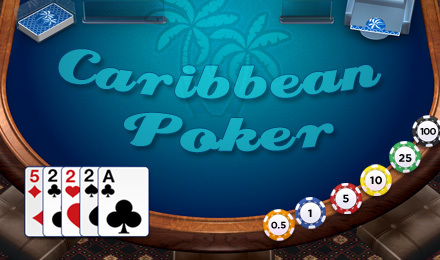 Caribbean Poker is an exciting poker style game offering thrilling gameplay and rich wins! Play your hand against the dealers and you could Win Big Cash Prizes! Play the exciting and fast paced Caribbean Poker at Wicked Jackpots! In this exhilarating poker style game, you play against the dealer instead of other players. It’s easy to play and all you have to do is set your bet amount and place your ante bet on the table. You’ll b dealt 5 cards face down while the dealer gets 5 cards with only one facing up. Based on your cards, decide whether you want to fold or raise. The dealer’s cards are revealed and whoever has the better hand wins!